GEORGE T. (Rusty) GRAY III is a Laboratory Fellow and staff member in the dynamic properties and constitutive modeling team within the Materials Science Division of Los Alamos National Laboratory. He came to LANL following a three-year visiting scholar position at the Technical University of Hamburg-Harburg in Hamburg, Germany having received his PhD in Materials Science in 1981 from Carnegie-Mellon University. As a staff member (1985-1987) and later team leader (1987-2003) in the Dynamic Materials Properties and Constitutive Modeling Section within the Structure / Property Relations Group (MST-8) at LANL, he has directed a research team working on investigations of the dynamic constitutive and damage response of materials. He conducts fundamental, applied, and focused programmatic research on materials and structures, in particular in response to high-strain-rate and shock deformation. His research is focused on experimental and modeling studies of substructure evolution and mechanical response of materials. He is a Life Member of Clare Hall, Cambridge University where he was on sabbatical in the summer of 1998. 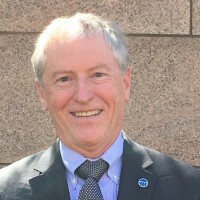 He is a Fellow of the Minerals, Metals, and Materials Society (TMS), a Fellow of the American Physical Society(APS), and a Fellow of ASM International(ASM). He is a member of APS, ASM, TMS, and serves on the International Scientific Advisory Board of the European DYMAT Association. In 2010 he served as the President of the Minerals, Metals, and Materials Society (TMS). He has authored or co-authored over 380 technical publications.